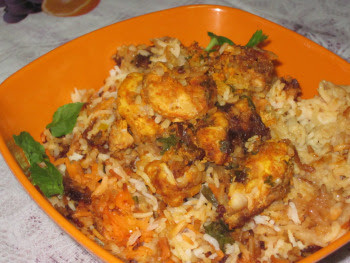 The Tummy Tales: Prawns Biryani!!! Being a South Indian, it would be criminal if I don’t put a post on rice anytime soon; and what better rice dish than the emperor of all dishes “The Biryani”. Not much is written about the history of this dish, but legend has it that the Persian soldiers (when going on longer journeys) carried with them a dish that was meat gravy topped with a layer of rice. Although there are many varieties of the biryani available world over, in India almost trace their roots to the kitchens of the Nawabs in Hyderabad and Lucknow. It is said that a particular Nawab boasted of 49 varieties in his kitchen. Essentially, biryanis are of two types, “Kachchi (raw) Biryani” as the marinated rice and meat are cooked together & the “Pakki (cooked) Biryani” this is where the rice and meat are cooked separately and then layered. Preparing a biryani is a long drawn, elaborate and tedious task. But believe me; it will be worth the effort. I guess with some planning and preparation, the task will be simpler and less strenuous. I had initially planned doing a either a chicken or mutton one; but there were some large prawns in the fridge & my mum felt that the best way to use them was in a biryani. You could replace the prawns with either mutton or chicken. Purists believe that the ratio of rice to meat should be 1:1 that is 1 kg rice for 1 kg of meat. However, I tried 1:0.7 that is 1 kg rice and 700 grams meat and it came out decent. A good biryani is only as good as the quality of rice used. So, make sure to use good quality and long grained rice. Needless to say, no being miserly on the use of ghee and spices. Well, get set for the grind of making the yummy Prawns Biryani. My suggestion is make a little extra, the aroma will draw all your neighbours and I’m sure they will not leave till they’ve had some. § Clean, De-shell and de-vein the prawns. § Slice the onions finely. Fry them in the oil till they turn golden brown; be careful since if they burn they will taste bitter. Once done place them on an absorbent paper to drain the excess oil. Let them rest for a while and allow them to get crisp. § Beat the curd well add in prawns and coat them well with the curd. To this add a little salt, ginger garlic pastes and all the other masalas mentioned under the marinade heading. § Crush the onions and add to the curd mixture. Remember to keep some aside for garnishing. § Add the juice of half a lime to it, finely chopped coriander and tear in a few mint leaves. § Mix well (take care not to damage the prawns) and keep aside for at least 2 hours. § Soak the rice for atleast 20-25 minutes in water before you begin working with it. § In a large pan heat water equivalent to double the quantity of rice. When the water starts boiling, add in the rice. § Add some ghee to the rice. This will ensure that the grains don’t stick to each other. Add in the all the ingredients mentioned under the whole masalas heading and some salt. § You will need to make sure that you constantly keep watch on the rice to make sure that it doesn’t get over cooked. § When the rice is about ¾ done, drain it on a colander and let it cool for a while. § Take out a large spoonful of the rice and keep aside. § Add ½ teaspoon of the turmeric powder to the milk and stir well. Pour this milk on the rice that has been kept aside. This will give the rice a nice yellow colour. Personally, I don’t like using artificial colouring. § Line a heavy bottomed vessel with ghee. § Add in the prawn marinade and spread well. Top this with a few mint leaves and half the coloured rice. § Now layer this with the white rice. Cover it with the remainder of the coloured rice and top it with the remaining fried onions and the mint. § Seal the vessel tightly and cook for about 30* minutes on medium flame and for another 10 minutes on a low flame. § Once done take out from the heat and let it rest for about 10-15 minutes. § Serve with refreshing raita. § The Prawns I used were of the large variety. So approximately I used about 12 prawns. § Kashmir Chilies are not spicy. But the powder gives a nice, bright red colour. § I used prawns so I have mentioned 30 minutes. Chicken or mutton should take about 45 minutes.